Message from the Management | CHUNICHI SEIKO Co., Ltd.
We work towards professional development to become the gear specialists you rely on. 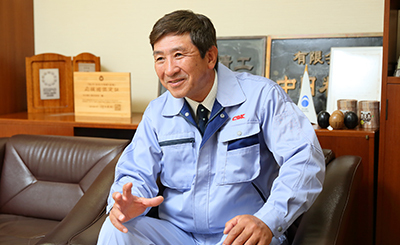 Tetsuji Yamamoto, president as of November 1, 2016, continues the philosophy of the previous president towards research and development of new businesses and efforts towards professional development. As we welcome the fiftieth anniversary of our founding we look towards another fifty. We asked Mr. Yamamoto to share about his determination and ideas. 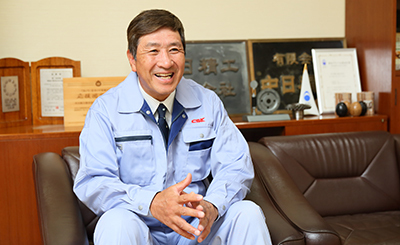 From our founding in 1966 we have developed and produced gears in Toyokawa for domestic and international use. We are in the midst of a transition in the automotive industry, where many gears are used, from gasoline to electric drive trains. As part of this sea-change, our role as gear specialists is to create gears appropriate for our times to provide to the world. Our first step towards this is the research and development of new businesses, putting next generation manufacturing likely to become major industries including robotics in our sights. People are the key to the innovation to use Chunichi Seiko’s fifty years of cultivated technology to make new things. In addition to research and development we have poured our efforts into professional development. This is something I learned at a company I worked at before. If a business were a train there are two kinds: one is the locomotive with a single car (the president) pulling along all the other employees, while the other is a train with each car self-propelled like a bullet train; each car independent but connected, moving forwards in the same direction. The rapidly changing times mean that it is not realistic for any single person to pull an organization. Chunichi Seiko seeks to be a “bullet-train” organization, with each department independent but connected and moving forwards together in the same direction. Broad discretion for management to make their own decisions. For this purpose, we have entrusted our manages with authority to make decisions. As they make progress in work with their own ideas, the organization becomes independently active. At the same time, responsibility is not just left in the hands of the manager, but they are subject to oversight and receive advice as needed. Additionally, they are shown the company P/L statements and other financial statements, enabling discussion based on management indices. We are a manufacturing company so it is easy for us to get caught up only in thinking about the technology. As they become management and understand the financial conditions of the company, we are able to talk about what is needed for the company based on clear numbers. With discussions based on this shared financial index information we are able to form an organization that moves together as one. We are putting effort into education for employees in addition to management. Chunichi Seiko has many new employees every year straight out of high school. High school is completed in three years, but after employment one spends decades at a company. Who will teach these new young professionals about business ethics and what it means to be a mature person. I think this is the responsibility of the company. I look them in the eye and share these things carefully with them. Looking forwards there are many places where one can lose one’s way in life. If we watch carefully and recognize changes in order to prevent and follow up on these issues. As this kind of small communication continues they can have peace and feel that someone is always watching. Just being aware of this fact helps people consider how they live. I think that professional development is like a gear. If the nearness we have with employees is like the degree of engagement between gears, should an employer get too close, the gear starts to spin unevenly, and too far also prevents it from functioning. Each person is different and requires their own approach. This is not connected directly to sales or other quantifiable characteristics making it an easy target for lower priority. This cannot be outsourced. We must do it in house. That is why I think it is important for us to continue focusing on this area. I know we will go farther and better as a team.